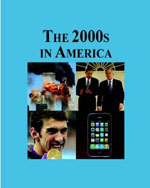 The 2000s in America edited by Craig Belanger, Salem Press, 2013. Over 400 subject essays span this 3-volume set. Essays focus on important people, ideas, and innovations of the 2000’s. Volume three also contains several lists pertinent to the 2000’s including: Major films, Academy Awards, Broadway plays, TV Shows, Legislation, and Best-Selling Books. Following this selection of lists is a year-by-year breakdown of key events that occurred during this decade. Read about: 9/11, Eminem, Flash Mobs, H1N1, Pixar, Tea Party Movement, Wikipedia . Access the online version of this Reference set (and other decades) by clicking HERE and accessing the “Salem History” database. The Twenties in America edited by Carl Rollyson, Salem Press, 2012. Almost 700 subject essays span this 3-volume set. Essays focus on important people, ideas, and innovations of the 1920s. Volume three also contains several lists pertinent to the 1920s including: Major films, Academy Awards, Broadway plays, TV Shows, Legislation, and Best-Selling Books. Following this selection of lists is a year-by-year breakdown of key events that occurred during this decade. Read about: Airmail, Bathtub gin, Marathon dancing, Photography, Rural life, Thompson machine gun. The Thirties in America edited by Thomas Tandy Lewis, Salem Press, 2011. Almost 700 essays span this 3-volume set. Essays focus on important people, ideas, and innovations of the 1930s. Volume three also contains several lists pertinent to the 1930s including: Major films, Academy Awards, Broadway plays, TV Shows, Legislation, and Best-Selling Books. Following this selection of lists is a year-by-year breakdown of key events that occurred during this decade. Helpful for research and fun for browsing! Access the online version of this Reference set (and other decades) by clicking HERE.